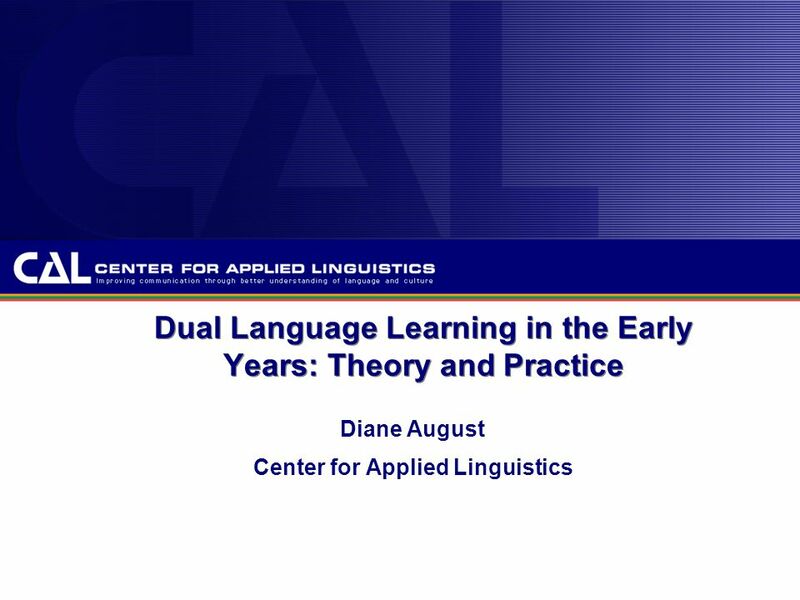 Dual Language Learning in the Early Years: Theory and Practice Diane August Center for Applied Linguistics. 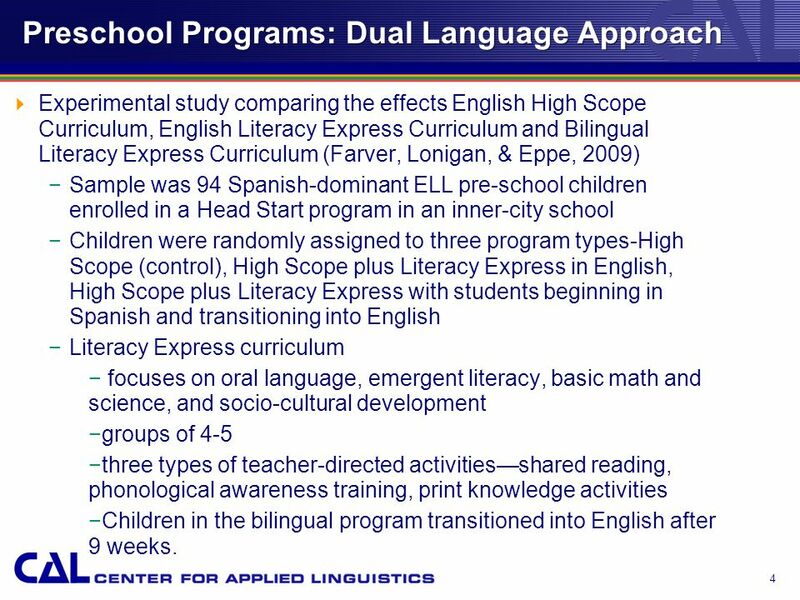 5 4 Preschool Programs: Dual Language Approach  Experimental study comparing the effects English High Scope Curriculum, English Literacy Express Curriculum and Bilingual Literacy Express Curriculum (Farver, Lonigan, & Eppe, 2009) −Sample was 94 Spanish-dominant ELL pre-school children enrolled in a Head Start program in an inner-city school −Children were randomly assigned to three program types-High Scope (control), High Scope plus Literacy Express in English, High Scope plus Literacy Express with students beginning in Spanish and transitioning into English −Literacy Express curriculum − focuses on oral language, emergent literacy, basic math and science, and socio-cultural development −groups of 4-5 −three types of teacher-directed activities—shared reading, phonological awareness training, print knowledge activities −Children in the bilingual program transitioned into English after 9 weeks. 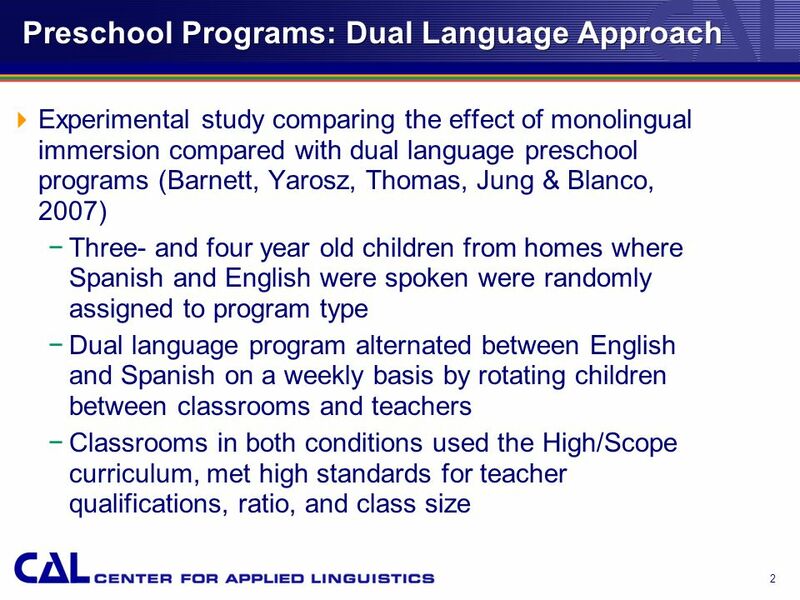 8 7 Preschool Programs: Dual Language Approach  Findings −Children learned a substantial number of words from the combined home and classroom reading experiences −Primary language home reading/English school reading as effective as English home reading/English school reading condition. 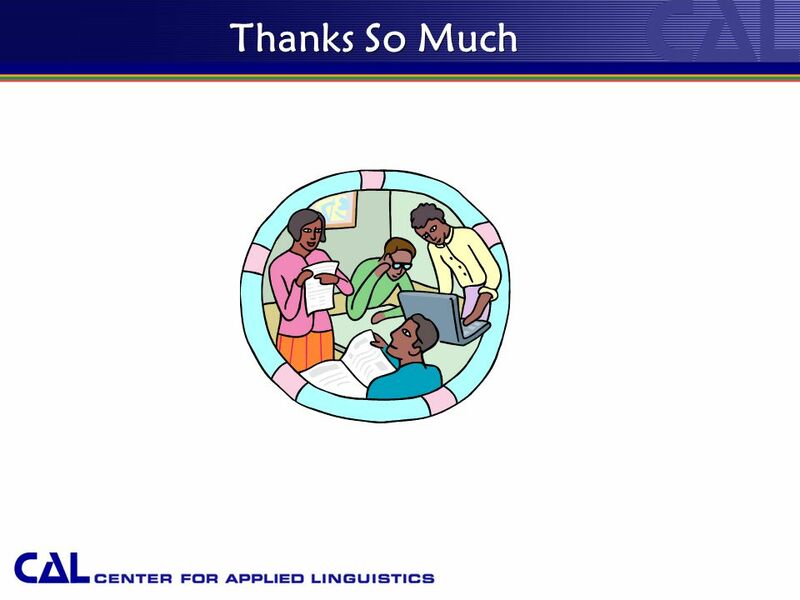 −Family caregiver participation in the parent-support part of the program rose from 50% to 80% in the second session −Family caregiver English oral language skills and the number of English books in the home related to English vocabulary learning. 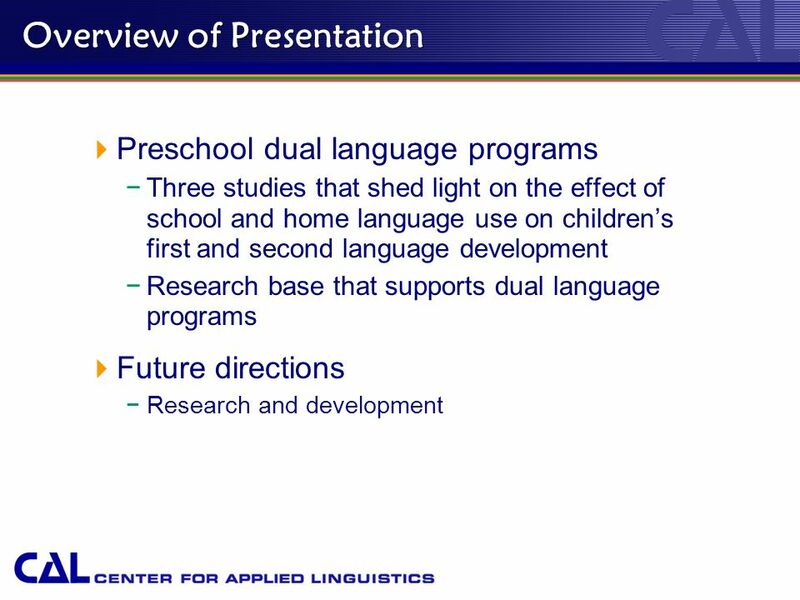 9 8 Dual Language Approach: Research Base −Transfer of skills from L1 to L2: if you know something in one language you either already know it in another language or can more easily learn it in another language (Cummins, 1979; Dressler, 2006) −Bilingualism itself does not interfere with academic achievement in either language (Yeung, Marsh, & Suliman, 2000) −Bilingualism has other probable benefits including cognitive flexibility (Nagy, Berninger, & Abbott, 2006; Galambos & Hakuta, 1988; Bialysotck, 2001) and improved family cohesion and self-esteem (Portes and Hao, 2002; Von Dorp, 2001). 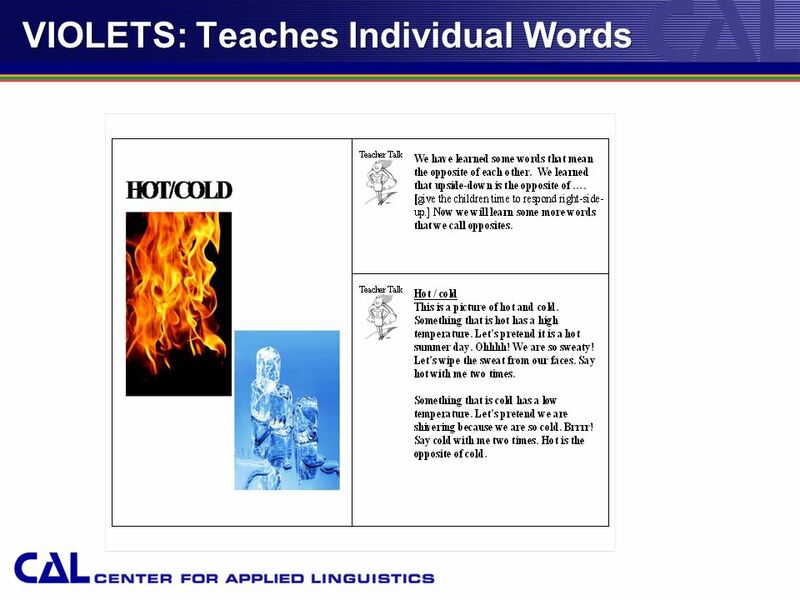 −, 2006). 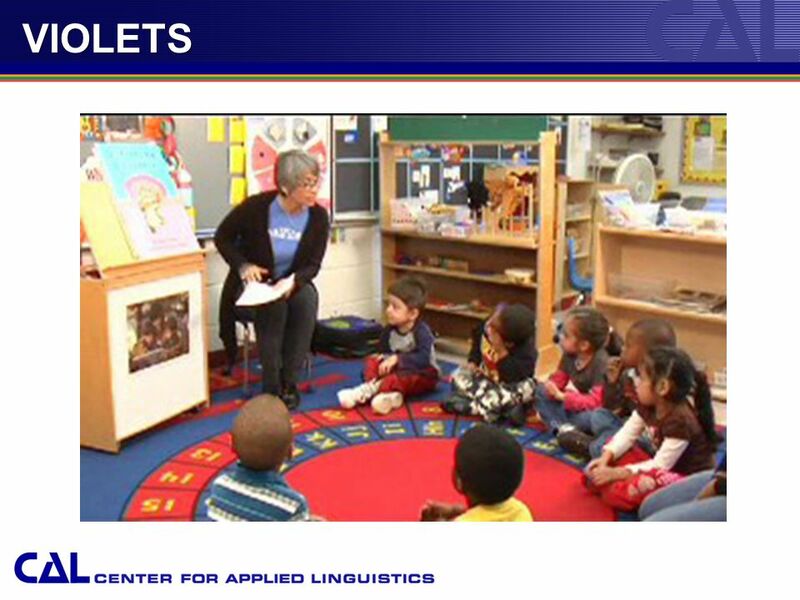 Download ppt "Dual Language Learning in the Early Years: Theory and Practice Diane August Center for Applied Linguistics." 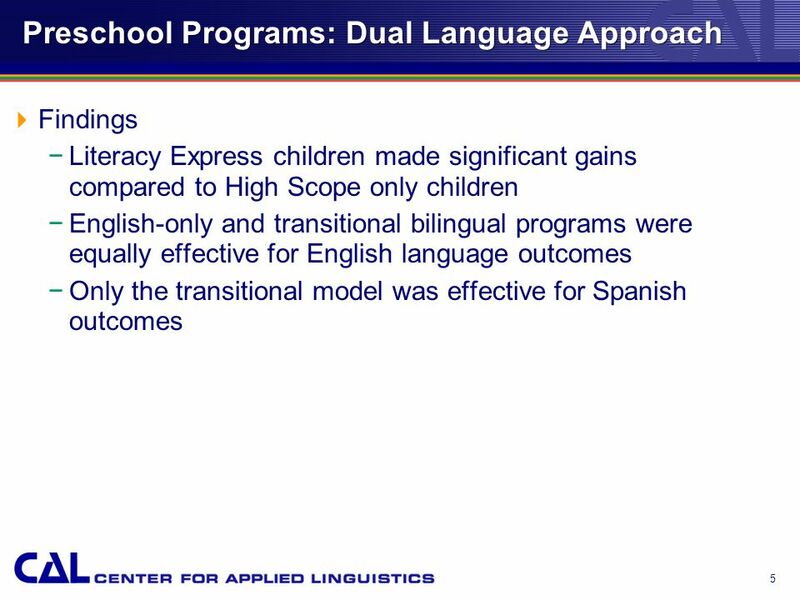 Study on Spanish Native Speakers Curriculum and Academic Achievement in Florida Paola A. Maino Ed.D Curriculum & Instruction University of Central Florida. 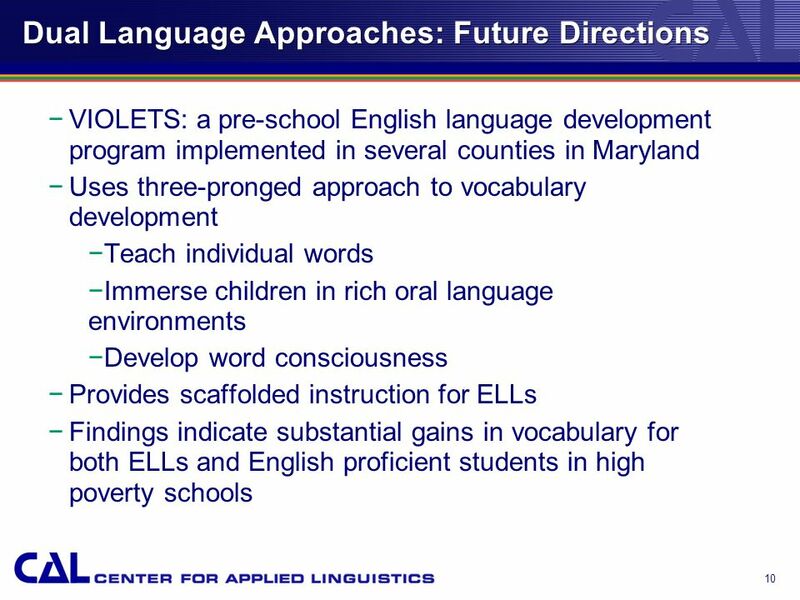 Improving Education for English Learners: Research-Based Approaches English Learner and Support Services Professional Learning Series January 6, 2011. Castle View, Jefferson, Mt. 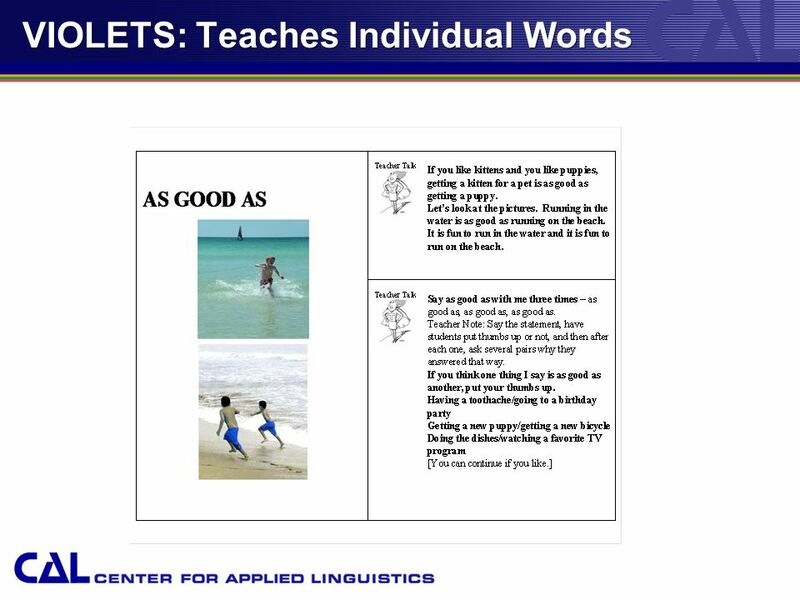 View and Washington Elementary Schools. 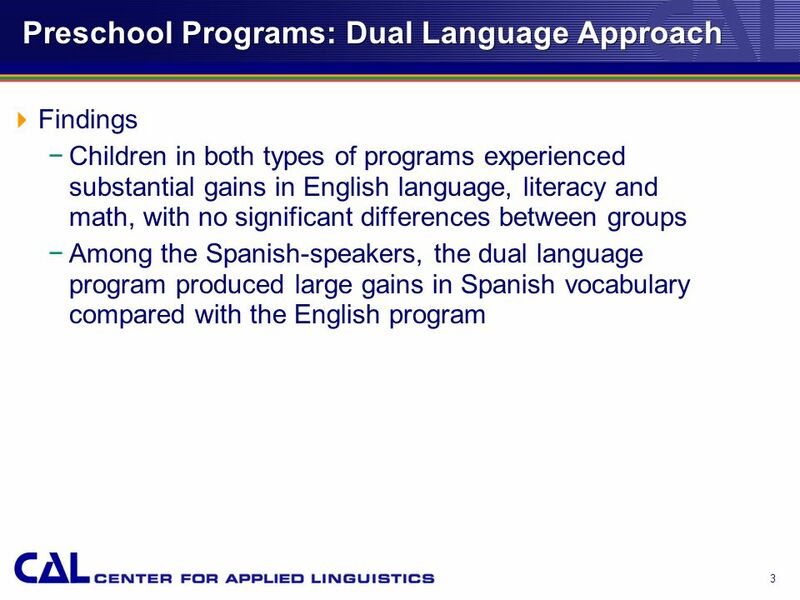 An Informational Overview: Dual Language Two-Way Immersion Magnet School of Choice. 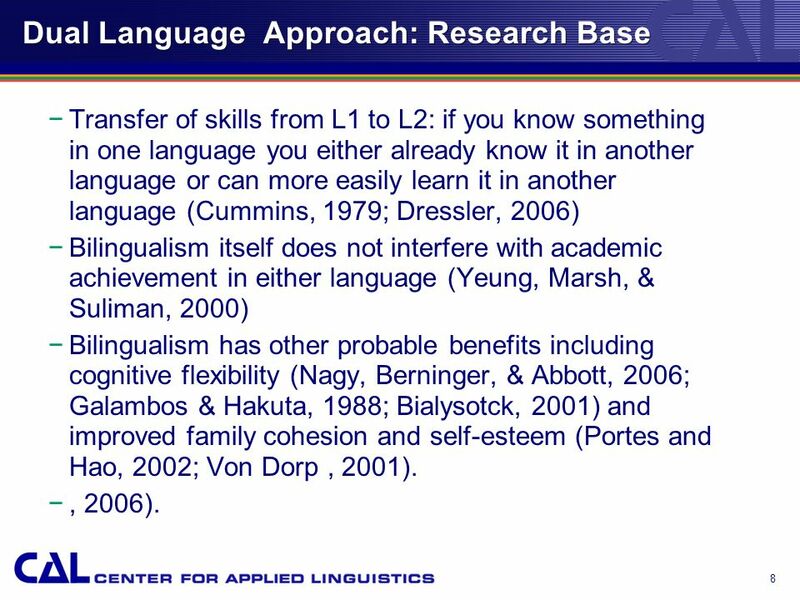 What is the purpose of bilingual education ? 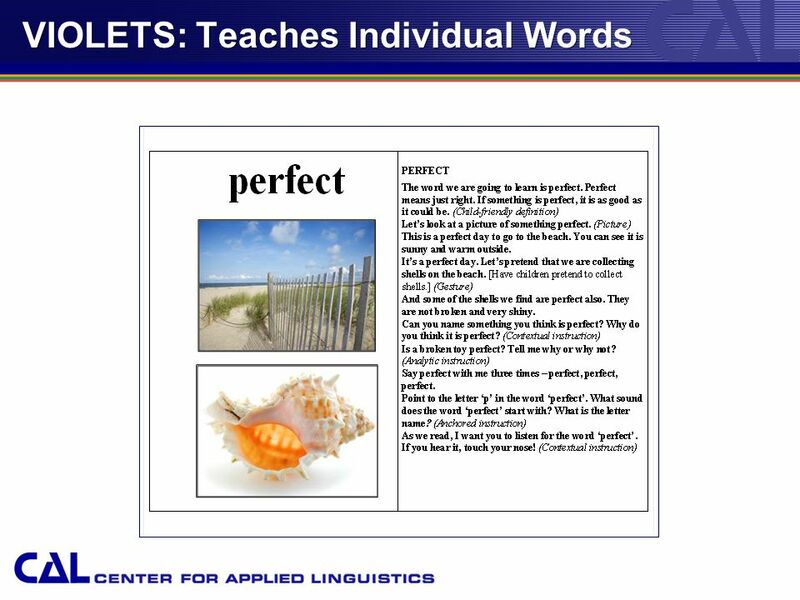 Early Reading First Project Professional Development Model Mary Abbott Juniper Gardens Children’s Project-University of Kansas Amy Herring Project. 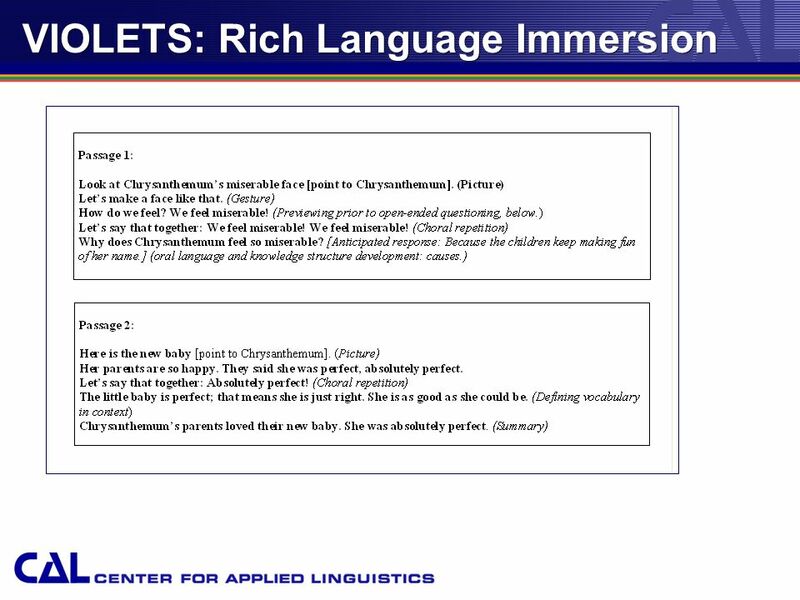 1 Effective Strategies for Bilingual and English Language Learners Early Childhood Summer Event Sponsored by Region 10 ESC June 24 and 25, 2015 Rossana. 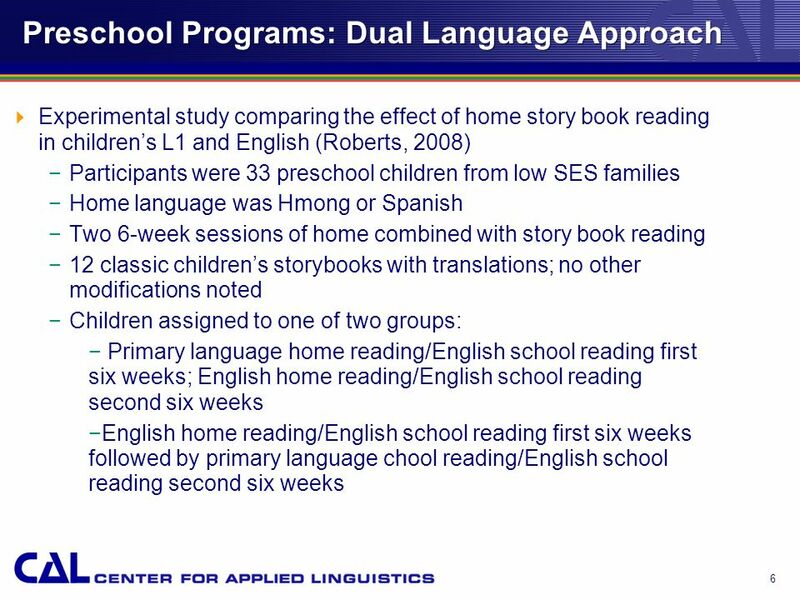 Early Reading First Project 2004-2007 Professional Development Model Mary Abbott Juniper Gardens Children’s Project-University of Kansas Amy Herring Project.